Success in the medical field is only found by the most intelligent, ambitious sims. Medical school is filled with studying and no pay, Residency has long hours, and the medical profession is all about honing in skills and building relationships with your patients. This is a difficult, yet rewarding career that many will fail in. Will your sim sink or float? I wanted to make this realistic, so, much like real medicine, this is a difficult career track to master. 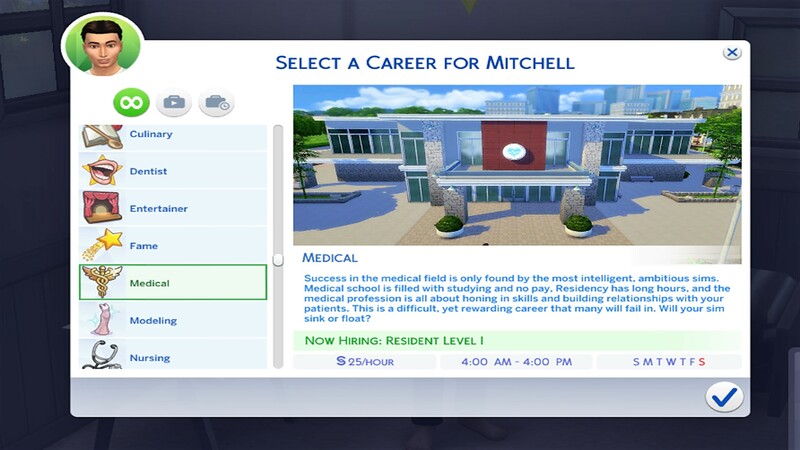 Sims start out as Med Students with no pay, so that's a good time for a Young Adult to stay at home with mom and dad or move in with a working roommate. Then, sims get promoted to Resident, where they get a small amount of pay before they choose which track they want to go through. This took a great deal of work, so I hope you enjoy it! Welcome to medical school! You've dreamed about this day your whole life, and here it is. Don't get too excited, though. Before you get to residency you have to gain skills and reach the top of your class. Make sure you make good relationships with your professors and fellow students. Almost there! You're becoming smarter and you're almost ready to enter residency. Don't get lazy now, though. Missing class will reek havoc on your performance and your chances for residency. You're learning more, and you don't feel like such a rookie anymore. But you ARE. Don't forget that! Mentor doctors want interns that are humble and ready to learn. You get a slight pay raise, but the hours and studying is still rough. Hang in there! Before you know it, you'll be a level III. Almost done! You've made great impressions on your mentors, and you're learning so much. Another pay raise and you're starting to feel like a real doctor. Technically, you are, but don't let that go to your head. You're still at the bottom of the hierarchy, but you're not far away from getting your first real job. Cardiologists deal with disorders of the heart. They diagnose and work with heart defects, coronary artery disease, heart failure, and many others. They perform surgery, and take care of patients post surgery. Sims entering this career must have logic skill and focus. There are lives on the line! Rookie Cardiologist Your first job! You're a newbie, so your patients don't exactly seem all that comfortable with you, so make sure you keep developing your logic and charisma skills to help put them at ease. Your patients range from babies to elders with heart defects, heart failure, and many other problems. It's a very stressful career, especially at the beginning, but it will get easier! Experienced Cardiologist You've been around a heart monitor a few times, and you are developing an interest in surgery. Make sure to keep developing your skills and relationships with your patients so the Head of Cardiology doesn't pass you up for a surgical position. Heart Surgeon The Head of Cardiology hired YOU as the newest member of his surgical staff! This is a very intense job; sometimes surgeries can last all day! You need to keep developing skills and expertise in your work.... You don't want to kill anyone! Director of Surgery, Newcrest Heart Center Wow. You've reached the top. Every resident and heart surgeon knows you're the one to impress. You're in charge of surgery at Newcrest Heart Center, which means you'll be hiring interns and placing them with doctors. You'll also (unfortunately) be handling any issues with patients and their families. Sometimes, though, when things are slow or there's a particularly difficult case, you're able to get your hands back into a bloody chest. Life is good. A career as a pediatrician can be a tricky one. Not only do you have to be intelligent and focused, but you have to be able to be silly to help those little angels feel more comfortable with you. You'll be diagnosing and treating common illnesses, and sometimes not so common ones. You're also in charge of teaching parents everything you've learned about parenting and child development. These little ones are in your hands. Rookie Pediatrician You're a newbie in the office, so parents are a little hesitant to send their children to you. Make sure you make a good impression with your coworkers and people in your community, because word-of-mouth is what will get you patients! Come to work feeling playful, because that's the kind of doctor the kids feel comfortable with. Before you know it, you'll be an old pro. Pediatrician-Newcrest Health Department You've been offered a job at Newcrest Health Department. It's a tough job, because many families who bring their children here don't know much about parenting... Some are basically children themselves! Because of this, one of your main jobs is teaching these parents how to parent. You see dozens of children a day, so don't be surprised if you go home exhausted. Pediatrician-Newcrest Hospital The bigwigs at the fancy hospital took a liking to you, and you've moved on up to their pediactric floor. You're seeing even more patients, most from all different backgrounds and walks of life. Keep that playful demeanor up and you're sure to find a place in these families' hearts. Pediatrician-Private Practice You've really made a name for yourself, so you've decided to open up your own private practice. You've hired a couple of doctors to work beside you, and you have a fantastic reputation around all of SimCity. It's still so hard having to see sick children every day, but seeing them in your very own office makes it a little sweeter. Who knows, maybe someday you could be Head of Pediatrics somewhere? Head of Pediatrics, Newcrest Pediatric Centers of SimCity You've taken the ultimate pediatric position. These centers in SimCity are havens for very sick children, and you've been hired to be in charge of all of them. Make sure you only hire the best doctors and buy the best medical supplies. These centers have a reputation to keep up, and that's on you. It's a stressful job, but seeing the gratefulness from the families makes it all worth it. Congratulations. Beauty is the name of the game as a plastic surgeon, but don't think that's it. Like alL MDs, plastic surgeons have to be extremely intelligent and sharp to succeed. With this specific career, patients expect their doctors to look and present themselves a certain way, so make sure you keep up your fitness and charisma skills, as well as your logic skill. Plastic surgeons often do botox, liposuction, face lifts, tattoo removal, and laser hair removal, but that's not all. They must have a wide-range of skills because many of their patients desire multiple, um, enhancements. Rookie Hair Remover ZAP! That's the sound of a laser burning hair off of a patient's leg. You're working in the laser hair removal wing of the hospital, so many days you'll come home smelling like a burnt pile of, well, hair. It's not the most glamorous job, but it's a very popular one these days. Stay charismatic with the boss and your coworkers and maybe you'll move up the ranks. Botox Connoisseur Did you know that injecting botox under the underarms can help stop overactive sweat glands? Of course you did, because you're a botox connoisseur! You're able to make Adult and Elder sims look like Young Adults again with just a few needle pinches, and patients couldn't be happier! Well, you guess not. It's kind of hard to tell by their lack of facial expressions. Head of Plastic Surgery, San Myshuno Hospital Your ability to beautify SimCity has landed you the Head of Plastic Surgery position. Not only do you get to keep performing surgery (your favorite) but you're in charge of hiring beautiful surgeons and making patients happy. Keep that body and attitude looking beautiful, because you're the FACE of plastic surgery around here. Congratulations! Dermatologists are in charge of keeping the skin, hair, and nails healthy. They manage acne, scars, moles, burns, warts, and many other physical problems. These doctors treat diseases of the skin, but much of what they do is cosmetic-related. Don't let that fool you, however. Sims going into dermatology must be just has smart and focused as in any other branch, so be prepared for a ride. Pimple Popper You've loved popping pimples for as long as you can remember, and now you get paid to do it! You're seeing poor sims with acne problems, many being teens and young adults. Help them extract their problems safely and hygienically, then offer them some of today's best cleanser regimens. They'll thank you for it. Dermatologist-Laser Therapist-Laser therapists are in charge of removing tattoos and scars from the skin's surface. Many of these procedures take multiple visits, so your same patients are coming in often. Keep your skills up, and make sure to keep relationships with those patients strong so they will refer other sims. Dermatologist-Phototherapist Phototherapists heal with light! You'll be using light therapy to help heal sims of acne, dermatitis, psoriasis, vitiligo, and sometimes even benign skin cancer. This is a big job that takes a great deal of knowledge of the field. Make sure you're studying the latest research and you treat your patients well. A raise could be in the future. Head of Dermatology, San Myshuno Hospital You were hired! Being the boss feels so good. You're in charge of running the dermatology division in San Myshuno Hospital, and it's a big job. Hiring the best dermatologists, keeping costs down, and keeping families happy are all tasks you must succeed in. And guess what? Sometimes you still get to pop pimples. Obstetrics Obstetricians care for pregnant sims, as well as deliver babies in both typical and emergency situations. They are surgeons, so they are able to aid with natural birth, as well as perform C-sections when necessary. Sims who choose to go down this career track must have logic skill, as well as parenting skill, because a large portion of their job is teaching new parents the ropes of childrearing. Rookie Obstetrician You're new to the surgical floor, so pregnant sims are a little weary to hire you as their obstetrician. Make sure to advance in your logic skill to put their fears at ease by proving you know what you're doing! It's also time to start studying up on your parenting skill since many of your patients are new parents without a clue as to what to do when their bundle of joy arrives! Keep your patients smiling and these babies healthy, and you're name will become more well-known. Experienced Obstetrician At this point, you've delivered so many babies that your name is getting around (in a good way!) Women are hearing great things about your level of care, so you are getting more patients than ever! The hours are still long and tiring, but the boss is taking notice of your work ethic, and has mentioned making you a mentor to the new residents entering the hospital. Keep up the good work, and you will be promoted to mentor. Mentor Obstetrician After two years of medical school and three years of residency, YOU'RE the teacher! Your new duties now include educating young residents on the in-and-outs of obstetrics, and it's important they learn their stuff because unborn babies are fragile. You have a gaggle of duckling-like students following you around the baby wing of the hospital, so keep them on their toes... their performance is YOUR reputation! Obstetrics Team Leader It turns out you're a fantastic mentor and all of your residents landed jobs quicker than any others. That caught of Head of Obstetrics' attention, so he decided to promote you to Team Leader. Now you're not just leading interns, but all of the OBs on the obstetrics floor. You'll be making sure they're up-to-date on all the latest research, as well as the latest surgical methods. Mothers' and babies' lives are at stake, so make sure you have the strongest team possible! Head of Obstetrics at San Myshuno HospitaL When the last Head of Obstetrics retired, he asked you to be his replacement! Now you're in charge of, well, everything. That means planning the budget for the OB floor, hiring and training doctors, taking care of lawsuits (unfortunately) and keeping patients and families happy. It's a huge job, but it's clear you're the right sim for it. Congratulations! Neurology Neurology is the branch of medicine concerned with the study and treatment of disorders of the nervous system. Because the nervous system is a complex, sophisticated system, only the brightest, most focused sims should pursue this career track. Neurologists treat diseases such as strokes, multiple sclerosis, Parkinsons' disease, and many others. Neurosurgeons operate on the brain and spinal cord, treating ailments like tumors and aneurisms. This is a stressful career, but the personal and monetary rewards are great. Rookie Neurologist You just got hired at Newcrest Hospital as a neurologist, and the stakes are high. Patients are coming to you with many complex disorders, so you better start maxing out your logic skill to make sure you give them the best care possible. The last thing you need is angry family members threatening a lawsuit! Give it time and patience, and one day you'll be much more experienced. Experienced Neurologist You've bad your dues as a rookie, and now you know your way around the brain and spinal cord. You've really made a name for yourself in Newcrest, and you're loving your job. As much as you do, however, you can't help but dream about neurosurgery. Surgery is the BIG time in this department, so max out that logic skill and you might just find yourself in an OR. Neurosurgeon You made it! You never realized just how beautiful a brain was until you drilled your first skull open. This is extremely sensitive work, and the hours are LONG; some of your surgeries take literally all day. Make sure you're loaded up on coffee and start brushing up on your handiness skill just in case you have an equipment malfunction mid-surgery. Head Neurosurgeon You're the "big sim" around the Neuro ward, and patients are begging to get on your operating table. You've managed to complete some majorly advanced surgeries, and the Director of Neurology has really taken a liking to you. Who knows.... He might even pick you as his replacement once he retires. Director of Neurology, Newcrest Hospital You made such a name for yourself that it was no contest when it came time to choose a new Director of Neurology. Now, YOU'RE in charge of it all! From hiring and training new staff and mentoring interns, you're doing it all. The best part is you're still finding yourself in the OR when a particularly difficult case comes along, and you're a "brain superstar" around Newcrest, with a "superstar paycheck" to match. Congratulations! ER Doctor ER doctors work in a fast-paced, highly stressful atmosphere. Sometimes, the ailment is minor like a broken bone, but other times it's extremely serious, like a gunshot wound. ER doctors must be "on" at all times, because they never know when the next big emergency is going to bust through the doors. Most work the nightshift, because that's when most emergencies happen, so this is a very tiring career track. Do you have what it takes? ER Triage Doctor You've been hired on to work triage at the Newcrest Emergency Clinic, so you're experiencing many different things. Sometimes the nights are boring. How many ear infections have you assessed tonight? But sometimes your night is filled with drama and stress. You're the first one these injured sims see, so make sure your logic skill is up to par, and keep on a happy face...no matter HOW sleepy you are! Emergency Helicopter MD How exciting! Now you're living the wild life, getting to be on the on-board MD on the emergency helicopters! These helicopters are flying-in extremely serious cases, like heart attacks and car wrecks, so you must keep calm and focused as you watch over your patients. You're in charge of keeping them alive before they reach the hospital, so distraction is not an option, no matter how late into the night it is. You can sleep when you're dead! ER Trauma Surgeon Now you're the one holding the knife! You've never experienced anything as intense as an ER operating room. Gun shot victims and bloody ailments pour in at all hours of the night, and you're in charge of saving their lives. If you have time, grab a cup of coffee in between patients, because nights are going to be long. And please, try not to slip in a puddle of blood! Emergency Room Team Leader You're in charge of rallying the troops and making the big decisions. When sims come in holding on to dear life, you're the one yelling out directions to other sims. There's no time to think, so you must work on pure experience and instinct. Your team is counting on you to teach and lead them, so it takes a real leader to succeed. You've made a name for yourself here, so keep it up and the top spot might be in reach. Head of Trauma, Newcrest Trauma Center You've saved so many lives that Newcrest has voted you in as the new Head of Trauma at their local trauma center. The trauma center is no joke; where the ER had downtime every once in a while, the trauma center doesn't, so you're always on-call. The good thing is, your days working nightshift are over, and you can start to live a more normal life with a flashy paycheck. Don't get too comfy, though; you never know when the next sims will be rolled through your trauma doors. Congratulations! The Sims Parenthood is needed for increasing Parenting skill, and The Sims Spa Day is needed for the Wellness skill. If you do not have these packs you can cheat the skills with MC Command Center or the UI Extension Mod. ** I would love to learn how to add chance cards to this career, so if you can help me, PM me!